Disclaimer: 1 at this offer, VIN # 505298. 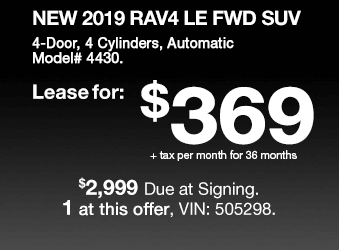 New 2019 RAV4 LE, 4 cylinders, automatic, model #4430. Lease for $369 per month plus tax. On approved premier credit, 36 monthly payments. Must Finance through TFS lease. Adjusted / Net Capitalized Cost $26,306. Amount due at signing $2,999 Amount of first month’s payment $369 plus tax. Amount of lease subvention cash $0. No security deposit required, 12,000 miles per year, $0.15 per excess mile. Sale price does not apply to lease. All advertised prices exclude government fees and taxes, any finance charges, $80 dealer document processing charge, any electronic filing charge, and any emission testing charge. Expires 04/30/2019. 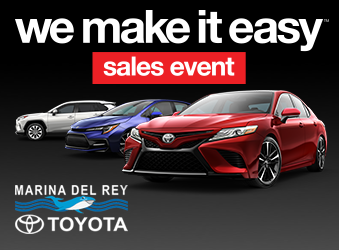 Silver Sky Metallic 2019 Toyota RAV4 LE 2.5L 4-Cylinder DOHC Dual VVT-i FWD 26/35 City/Highway MPG Marina del Rey Toyota has been a family-owned business since 1995, and that experience informs how we treat our customers. From our award-winning service to our commitment to the environment, we’re here to serve the greater Los Angeles community. Come see our whale mural that stretches the whole length of the building, and see why we promise that you’ll “Get a Whale of a Deal.” All advertised prices exclude government fees and taxes, any finance charges, any dealer document processing charge, any electronic filing charge, and any emission testing charge. Please note that offers can change day-to-day, and all displayed prices or offers expire at close of business today. Midnight Black Metallic 2019 Toyota RAV4 LE 2.5L 4-Cylinder DOHC Dual VVT-i FWD 26/35 City/Highway MPG Marina del Rey Toyota has been a family-owned business since 1995, and that experience informs how we treat our customers. From our award-winning service to our commitment to the environment, we’re here to serve the greater Los Angeles community. Come see our whale mural that stretches the whole length of the building, and see why we promise that you’ll “Get a Whale of a Deal.” All advertised prices exclude government fees and taxes, any finance charges, any dealer document processing charge, any electronic filing charge, and any emission testing charge. Please note that offers can change day-to-day, and all displayed prices or offers expire at close of business today. 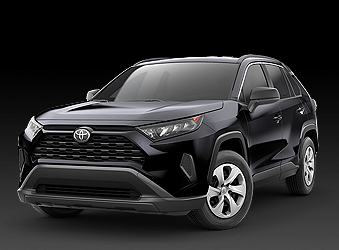 Midnight Black Metallic 2019 Toyota RAV4 XLE 2.5L 4-Cylinder DOHC Dual VVT-i FWD 26/35 City/Highway MPG Marina del Rey Toyota has been a family-owned business since 1995, and that experience informs how we treat our customers. From our award-winning service to our commitment to the environment, we’re here to serve the greater Los Angeles community. Come see our whale mural that stretches the whole length of the building, and see why we promise that you’ll “Get a Whale of a Deal.” All advertised prices exclude government fees and taxes, any finance charges, any dealer document processing charge, any electronic filing charge, and any emission testing charge. Please note that offers can change day-to-day, and all displayed prices or offers expire at close of business today. Midnight Black Metallic 2019 Toyota RAV4 XLE 2.5L 4-Cylinder DOHC Dual VVT-i AWD 25/33 City/Highway MPG Marina del Rey Toyota has been a family-owned business since 1995, and that experience informs how we treat our customers. From our award-winning service to our commitment to the environment, we’re here to serve the greater Los Angeles community. Come see our whale mural that stretches the whole length of the building, and see why we promise that you’ll “Get a Whale of a Deal.” All advertised prices exclude government fees and taxes, any finance charges, any dealer document processing charge, any electronic filing charge, and any emission testing charge. Please note that offers can change day-to-day, and all displayed prices or offers expire at close of business today. Super White 2019 Toyota RAV4 Hybrid XLE 2.5L 4-Cylinder AWD 41/38 City/Highway MPG Marina del Rey Toyota has been a family-owned business since 1995, and that experience informs how we treat our customers. From our award-winning service to our commitment to the environment, we’re here to serve the greater Los Angeles community. Come see our whale mural that stretches the whole length of the building, and see why we promise that you’ll “Get a Whale of a Deal.” All advertised prices exclude government fees and taxes, any finance charges, any dealer document processing charge, any electronic filing charge, and any emission testing charge. Please note that offers can change day-to-day, and all displayed prices or offers expire at close of business today. Red 2019 Toyota RAV4 Adventure 2.5L 4-Cylinder DOHC Dual VVT-i AWD 25/33 City/Highway MPG Marina del Rey Toyota has been a family-owned business since 1995, and that experience informs how we treat our customers. From our award-winning service to our commitment to the environment, we’re here to serve the greater Los Angeles community. Come see our whale mural that stretches the whole length of the building, and see why we promise that you’ll “Get a Whale of a Deal.” All advertised prices exclude government fees and taxes, any finance charges, any dealer document processing charge, any electronic filing charge, and any emission testing charge. Please note that offers can change day-to-day, and all displayed prices or offers expire at close of business today.